My first day at the Christchurch WORD Festival this year has been about pathways and dirt tracks and maps. 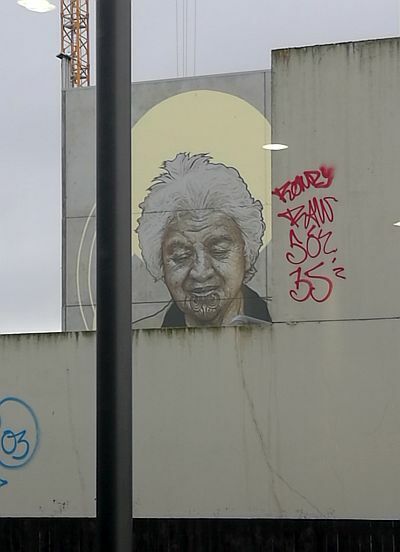 It began when Sacha McMeeking, at an event on the 125 years of women’s suffrage in Aotearoa, suggested the need to carve new paths as a metaphor for the creation of new social habits (which is also a metaphor). Human rights, she claimed, don’t change the world: they can help you formulate an ethical demand but are not enough to achieve economic justice or maintain social change. The image of the path carved into the dirt by the repeated passage of people reminded me of the wonderful metaphor employed by Walter Ong when he described oral literacy as producing ‘mnemonically tooled grooves’ for the transmission of knowledge. I think this is the kind of habit-forming collective work that McMeeking was advocating for. I don’t know if it’s the setting that creates a theme or simply highlights its salience but obviously you cannot help thinking of the ground when you’re in Christchurch. It’s like a background imagery one takes into every session and maybe that’s why all of the ones I have attended so far seemed to be about whenua, about groundedness. Did I hear Selina Tusitala Marsh describe the rubber foot of her poet laureate’s tokotoko as helping her to remain ‘heeled in’? I’ll have to verify that detail. 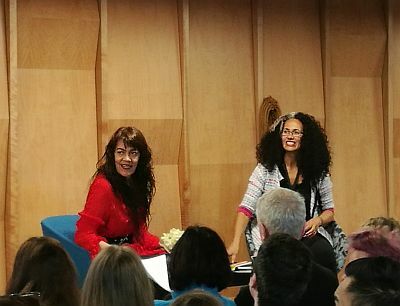 In fact I wish I could sit here in my hotel room and replay her entire session with Tusiata Avia, which was commendably free to the public and probably the best I’ve seen at any festival. Gem Wilder has written an almost-live review of it on the booksellers’ website but there’s so much more all of us who were there could say. I’ll just note that there is a very particular kind of generosity that the best of our writers can display towards one another – it, too, is culturally inflected, mnemonically tooled – and that it was a joy to be in the presence of such an abundance of it. Looking at the world differently means looking at a different world. This is my loose interpretation of something Dame Anne Salmond said in response to a question at the end of her session. If that is true, when we map a territory not just the tools we choose but also the names we use effectively describe not the same place differently but a different place altogether. At another of today’s events that were free to the public, Takerei Norton, Helen Brown and David Higgins introduced the extraordinary Kā Huru Manu, a world-leading cultural mapping project aimed at producing an atlas of the place names, Māori reserves and travel routes of Ngāi Tahu. Anyone who had the opportunity to hear Ta Tipene O’Regan talk about geography and storytelling at previous editions of the festival will immediately understand what this project is about and why it matters. The largest portion of their presentation focused on the names, which didn’t have to be merely recorded but often painstakingly uncovered or recovered, so quickly did the process of colonisation and the redrawing of maps conceal them or alter them. The atlas went live earlier this year with over 1,000 place names out of the 6,000 in total that it comprises. As Brown and Norton explained, the balance will be added only after their local people have had the opportunity to spend enough time with them. It is a matter of being reacquainted, in the knowledge – again – that name mean things and that socially inhabited places can’t exist without them. As the title of the session read: names are the treasured cloak which adorns the land. Il mio bel San Giovanni . My dear, beautiful San Giovanni. Of all the buildings that survive from the time of Dante’s Florence, this is both the most famous and the one he cherished the most. While the construction of the adjacent Santa Maria del Fiore began five years before Dante was exiled from Florence, it wasn’t completed until the fifteenth century. 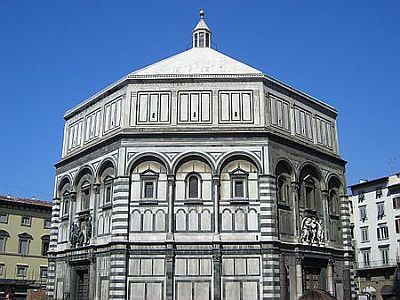 Its current baptistry, however, with which the Duomo forms nowadays a sublimely harmonious pair, was erected much earlier, between 1059 and 1128. I saw it this year with my youngest son, on the first warm day of the Italian spring. But we didn’t go inside – the queue was prohibitively long. There it is, the old San Giovanni, identical that what it would have looked like in Dante’s times, except for its three doors – including the one dubbed by Michelangelo The Door of Paradise – which have since replaced the medieval originals. Dante was baptised here and, after becoming a magistrate of the city, once ordered that one of its marble baptismal wells be broken because someone had got stuck in it and was at risk of drowning. The things of god are spiritual gifts, such as the power to administer the baptism which the biblical Simon Magus, as reported in the Acts of the Apostles, tried to buy for money from Saint Peter. Hence the sin of simony, which was rife in this century leading up to the reformation. Glancing at the third ditch and its inhabitants, Dante notes that the ground is riddled with round holes roughly of the size of the baptismal wells in the bel San Giovanni (there it is), and that the damned are planted in these holes upside down, so that only the legs are sticking and all they can do is kick with varying degrees of frenzy. Oh, and their feet are on fire. Because Qual suole il fiammeggiar de le cose unte / muoversi pur su per la strema buccia, / tal era lì dai calcagni a le punte. Like the fire burning on a greasy object moves only across the surface, so too the fire that burns the souls is only visible at their extremities. 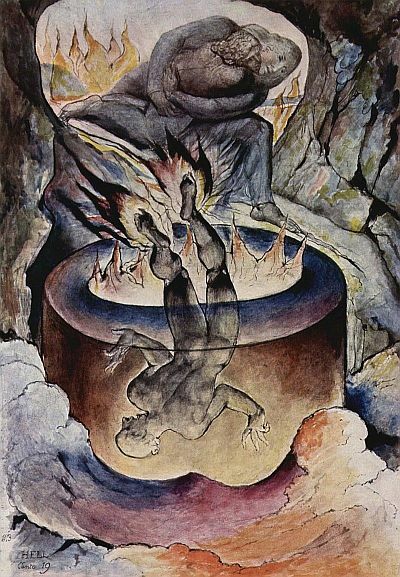 William Blake depicted the wells like roomy baptismal fonts. It’s a nice illustration, but in the scene that Dante describes the souls are much more tightly stuck. The anonymous engraver of the 14th century Codex Altoniensis seems closer to the mark. Now, consider the following question: you are Dante and you desperately want to put in Hell your most bitter of enemies, Pope Boniface VIII, except at the time in which you set your poem he’s not dead yet. What would you do? Dante’s solution is of the utmost narrative elegance: he has one the stuck-upside-down souls mistake him from Boniface. Remember, the souls of the damned don’t know what is happening on Earth in the present but have some knowledge of the future, so this mistake has the value of a prophecy. Boniface will end up in Hell, and so will his successor, Clement V, who succeeded Boniface in 1305 and died in 1314, not before having shifted the papacy to Avignon. As for the soul addressed by Dante in the present tense of the poem, it’s yet another pope: the less famous but nonetheless thoroughly rotten Nicholas III, who occupied the Holy See between 1277 and 1280 and, by all accounts, traded for the benefit of his wider family all the roles and offices that weren’t nailed down (as it were). He is stuck here, waiting for Boniface to arrive, at which point he will be pushed deeper into the hole – which already contains other, unnamed popes – and then Boniface himself will be corked in further when it’s Clement’s turn to be the kicking one: like in a slow but endless game of whack-a-pope. The remainder of the canto takes the form of a furious reprimand aimed by Dante to the captive pontiff, but targeting more broadly the corruption of the Catholic Church from the original sin of the donation of Constantine onwards: an arc of depravity that fails to bend towards redemption or justice. 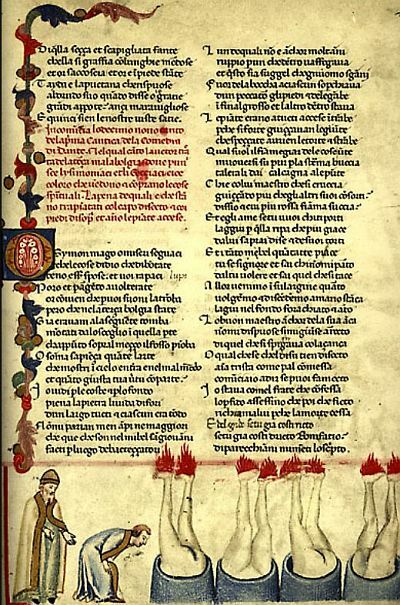 It’s an incendiary political speech that Dante wrote and published in exile, while harboured by a foreign court, knowing that in all likelihood he would never get to see his bel San Giovanni again. Previously: Inferno I, II, III, IV, V, VI, VII, VIII, IX, X, XI, XII, XIII, XIV, XV, XVI, XVII, XVIII.